Give your outgoing mail a classically feminine makeover with this pretty pink plaid pattern! Plaid is one of those timeless fashion statements that can be both fun and stylish. Now you can brighten up your otherwise ordinary mail and make it stand out from the rest of the pack by adding these attractive address labels. Plus, not only do they look sweet, they'll also save you a ton of time. Instead of scribbling your name and address on every envelope, a self-adhesive backing allows you to stick it right in place! 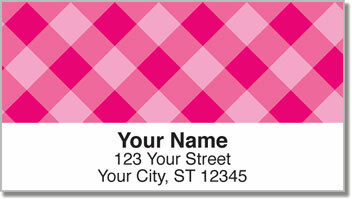 Make Pink Plaid Address Labels yours right now! Order them with a set of matching personal checks.